Very efficient and effective process. I enjoyed the combination of online, which helped me get my thoughts organised, and face to face discussions. Jonathan Pollinger is a social media trainer, helping social media professionals keep up-to-date with and implement the newest features and techniques. He came to us, because he wanted a brand that more accurately reflects what he does, which his former DIY brand didn't. Also, as he is his business, the new brand needed to accurately reflect him, which was “another motivator for change” for Jonathan. Jonathan’s social media trainings are very result orientated, so that his clients actually achieve real results afterwards and feel inspired to further implement what they’ve learned. His vision is to help (mainly small) businesses, organisations and charities use the full potential of their social media, become the UK’s leading social media trainer and maybe move into a more leading, authority, lecturer, commentator type roll. 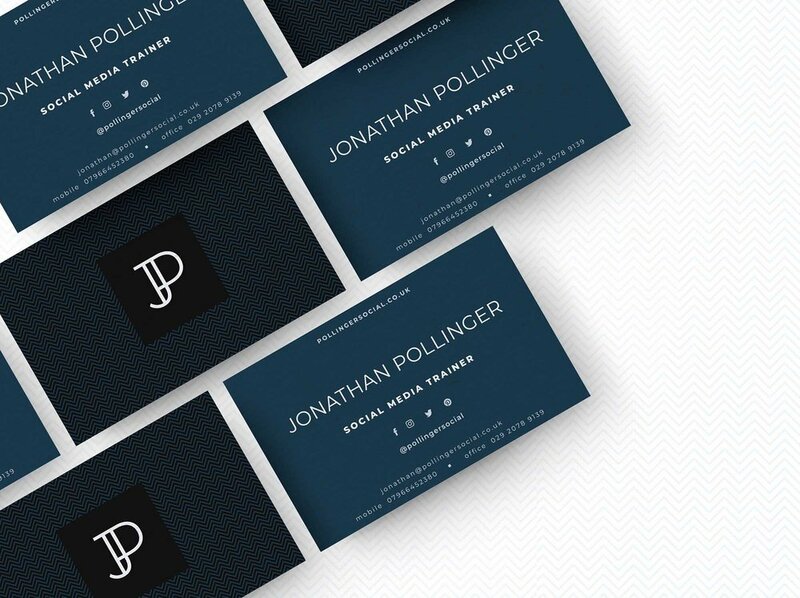 Jonathan wanted his brand to reflect his friendly but professional vibe with an emphasis on quality. I've always been interested in how technology can be used to connect people and build relationships so when social media came about, I wanted to get involved. I help clients to connect with their audience using Facebook, Instagram, LinkedIn, Twitter and Pinterest. So for a business it's prospects and customers and for a charity it's supporters and volunteers. Social media can work throughout an organisation so for example I will show clients how they can increase sales, improve customer services or raise funds for their charity. I've been impressed with Visuable's social media and noticed a number of case studies that clearly showed their creativity and professionalism. I’ve also been following Lidia’s helpful posts on LinkedIn for a while. Very efficient and effective process. I enjoyed the combination of online, which helped me get my thoughts organised, and face to face discussions. Delighted with the outcome! What responses or results have you received since launching? Very positive so far and several people have commented that it makes a lot of sense to go with my name as I brand. One person said it did look like branding for an upmarket car but that’s fine by me. At least they didn’t say a ‘budget rental car’! Use the new brand as part of a marketing push to pick up some new clients plus I’ll be getting in touch with existing clients.